There’s a stereotypical belief that those who graduate with a liberal arts degree end up working at Starbucks or some similar place of business and don’t fulfill the objective of their major. However, William Driver, a senior political science major at Gannon University, is hoping to change this stereotype. Recently he announced his candidacy for a seat on the Erie County Council, running to represent the 7th District. Driver, a Democrat who once chaired the Security Council for Model UN, said that his time at Gannon helped shape his desire to enter public service and served as a motivator to run for public office. “Gannon’s emphasis on community-oriented values really helped me to embrace my local community and want to be an active participant in it,” Driver said. Driver said he studied under Mark Jubulis, Ph.D., an associate professor of political science, for the past three years, and Jubulis had an impact on his decision to get involved. “One of the most important ideas that he passes on to his students is the concept of subsidiarity – that issues are best handled at the most local level possible with the greatest possible contribution from those most affected,” Driver said. Driver thought long and hard about whether it was the right avenue to pursue, but eventually decided to throw his hat into the ring. “Out where I live, we’re all friends and neighbors and I feel that our area is underrepresented at the county level,” he said. Driver listed solving property tax increases, budget problems and first responder issues as the key ideas driving his campaign. 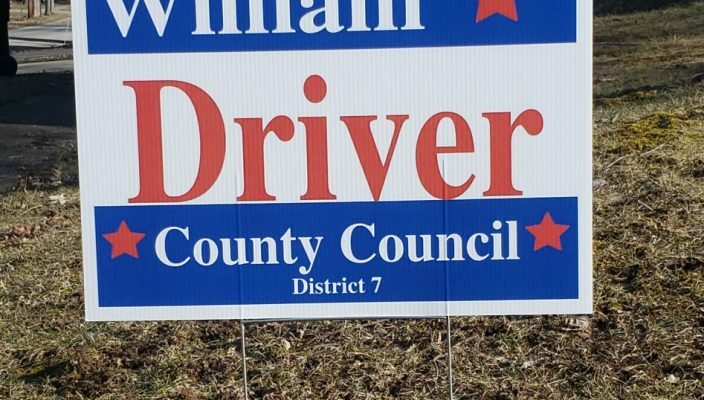 “District 7 is made up of areas and people that mostly can’t afford even a small property tax increase, and have no rainy-day funds to dip into,” Driver said. On the issue of the county budget, Driver said his top priority, should he win, would be to focus on generating solutions to the budget problems and to look into alternative income sources. “I also feel that on the county level we really need to address the problems faced by our volunteer fire departments and give these first responders the support they need,” he said. Across the country, as millennials begin entering the political arena, there continues to be a stigma on young people with a lack of much real-world experience running for office; however, he does not see or feel it. “In my experience, there is no stigma,” Driver said. The Pennsylvania primary will be May 21. Driver faces one opponent, Rita Bishop, in the Democratic primary.